A Beta-Reader and Author Correspondence. Amber Wake: Gabriel Falling. With Amber Wake: Gabriel Falling out for almost a month now, with reviews coming in from continents all over the place, the majority of which are 5 Stars, I thought I would share some correspondence I had with one of my beta-readers, author Annette Rochelle Aben. Not every beta-reader is asked to give the same feed back. Knowing Annette’s affinity was not for the Pirate genre, I asked for feedback with that in mind. I have finished reading your novel. Congratulations, this is really good. Considering I had second thoughts after I said yes, simply because this is NOT a genre I would normally read, I was pleasantly surprised. So, what’s my next step, how can I help you with this? Mainly your opinions, likes, dislikes. Anything that didn’t work for you. I wrote with believable characters in mind, not super heroic or over the top, except for Wallace’s resolve about character/beliefs/behavior/loyalty and the like. I must say that I did find the characters to be believable, and if this makes any sense, very human. I was expecting the story to be violent and crude, and that would turn me off completely. However, in your story, I felt like I was simply experiencing men who would have been pirates around the time of Errol Flynn. You had a part where this was pretty much spelled out when you wrote that a good captain would take care of his men, feed them properly, etc. and they would want to stay and work with him. That, of course, comes closer to the end of the book, yet I felt that way all the way through. There was a lot of feeling of YOU, a Southern gentleman, all the way through. I felt as though I were reading a story about people I wanted to know more about, which again, was very surprising to me. So, what didn’t work for me.. gee whiz. I got the impression that the “down with the establishment” or “getting some of my own back” motivation was present but I’m not certain the differences were spelled out. Like here is one chapter of what life was like IN the Navy and the next chapter telling the story of what life was like as a pirate. If this was done for each character, the back and forth thing, it might have brought a different level of contrast to the story. Not that one needs to legitimize the role of a pirate, almost pointing out that they were driven to that life. Did that make any sense? So happy for you, Ron. This is quite the endeavor and you seem to have a firm grasp on how to make it happen. Oh, and the ending? Left the door open and peaked the curiosity! As with all the beta-readers involved, the information was considered and applied to the manuscript where did appropriate for our purposes. There really wasn’t much we could do about the line between pirate and Navy life as there is a blurring of the lines in the book because of the situation Captain Wallace and his crew are in. Once you read the book you’ll understand what I mean. The one part edited about the girl in the story was done so due to a spoiler of sorts. Annette is correct in that I did put a lot of me into the creation of Gabriel Wallace. In the future, Wallace becomes someone else, and that character changes over time because of life and situations that warrant that change. At the core, he’s the same man in both this book and the future, just the exterior is different. A obvious captain in the Royal Navy would not fair well in the later adventures that have been written about Wallace. Part of my mission was to give a history and foundation for a character who could be that future character that now exists in other books in the series. He had to be a man who could lead, teach, and love. The love aspect is not as prevalent in the book because it is not a romance, but there are hints of the romantic in him because of certain conversations had, and Wallace’s views about women and being a man. With the correspondence and the reviews coming in so far, I think PS Bartlett and I achieved our goal. The ending was changed from the original manuscript to meet future plans, and that ‘peaked the curiosity’ is thanks to PS Bartlett. My original had more of a closure but open to further adventure because we weren’t sure if there would be a second book or not at the time. I think PS Bartlett has some plans you may be interested in. She also made more sense in the location of a Naval battle I wrote. Where I had Wallace doing what might have made sense in some historical sense, she gave it a better flow with how the story was going and headed. As well, I think the location of the battle might come in handy in future stories. A very smart change on her part. Annette did give the book 5 Stars on Amazon and Goodreads, but she didn’t gush about it. She gave a straight forward reader review rather than an Author Reader Review. I know all of you can tell the difference. 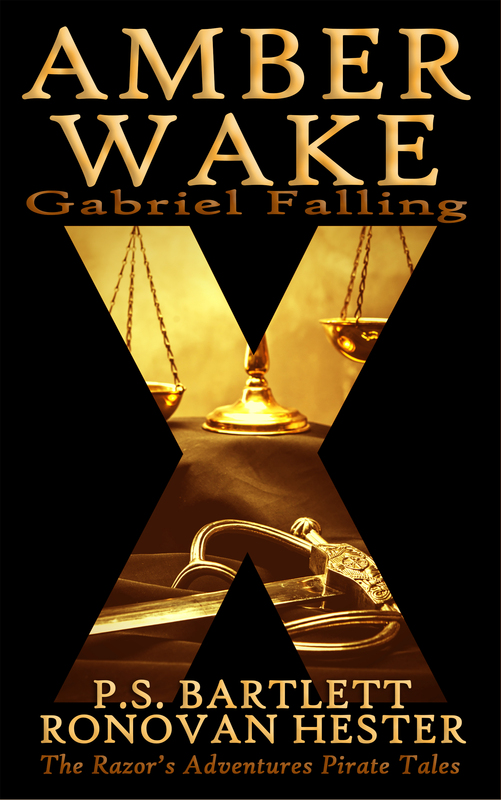 Posted on March 12, 2016 March 12, 2016 by RonovanPosted in Amber Wake: Gabriel FallingTagged Action, Adventure, Amazon, Amber Wake: Gabriel Falling, Annette Rochelle Aben, Author, Bet Reader, Correspondence, Fiction, Historical, Kindle, Review. Next Next post: Untold Tales of Amber Wake: Gabriel Falling-The Request. Gosh, I didn’t even know what was to be expected of a Beta-Reader, so I hope I did that right. Truly did enjoy the book and am honored to help promote it. Hearty congratulations are in order!